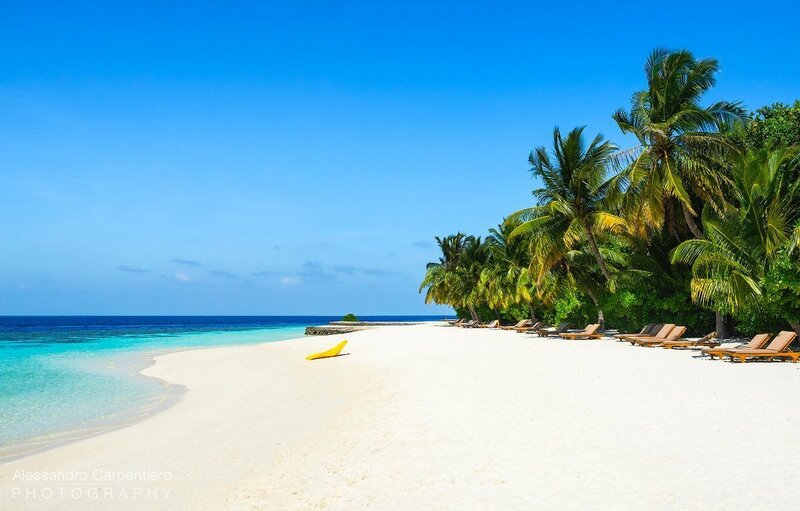 Lily Beach is located on Huvahendhoo island, which is part of the Dhaalu Alifu atoll. 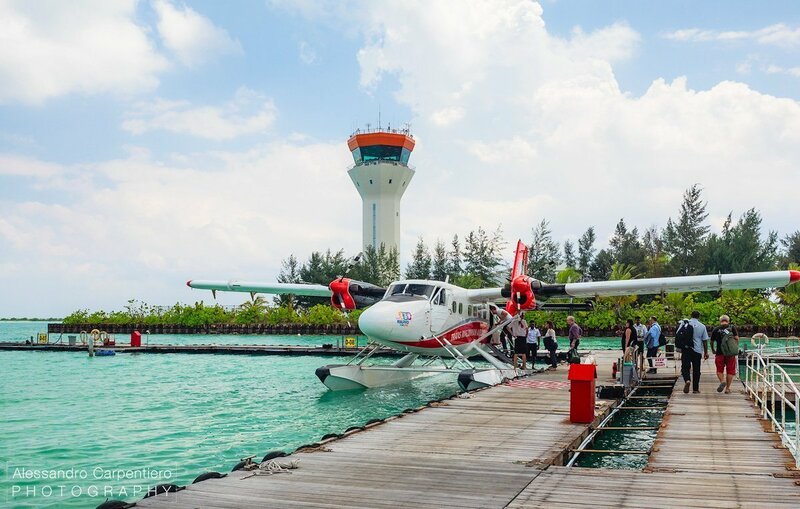 After your arrival to the international airport of Malé (MLE) you will be welcomed to the Trans Maldivian Airways VIP Lounge, where a 25min seaplane transfer will be waiting for you. 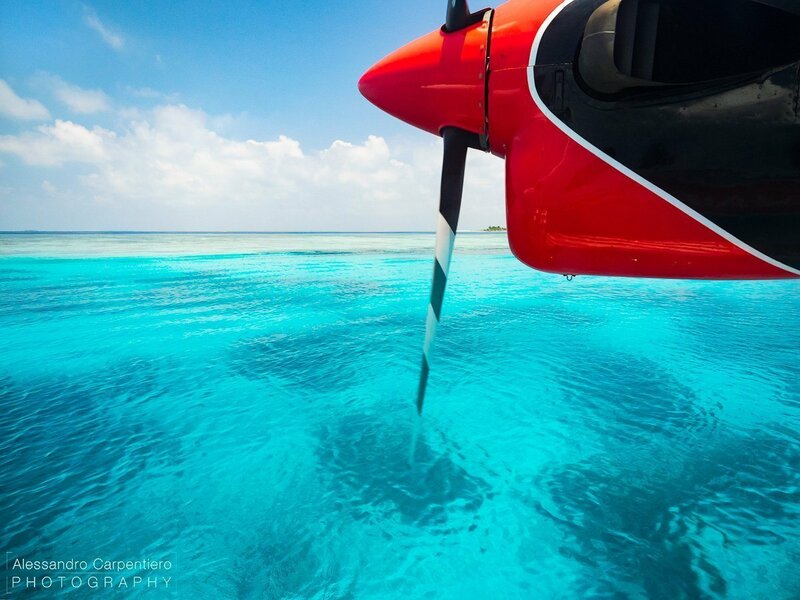 Seaplanes are normally pretty small and noisy, but the whole experience, the rush that you get while seeing yourself lifting from the ocean (and the view!) will make that definitely worth it. Seriously, how incredibly colorful is this ocean? 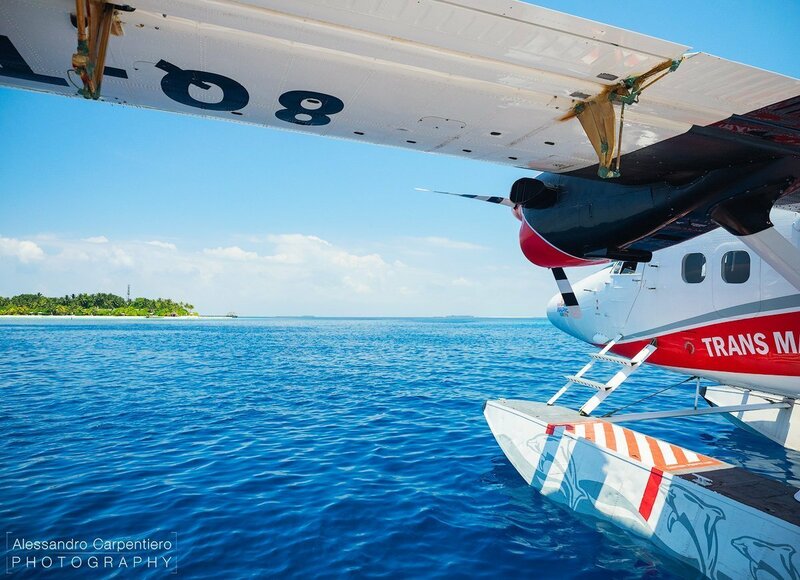 After a very soft landing on water you’ll be able to see your house for the upcoming days: Paradise! 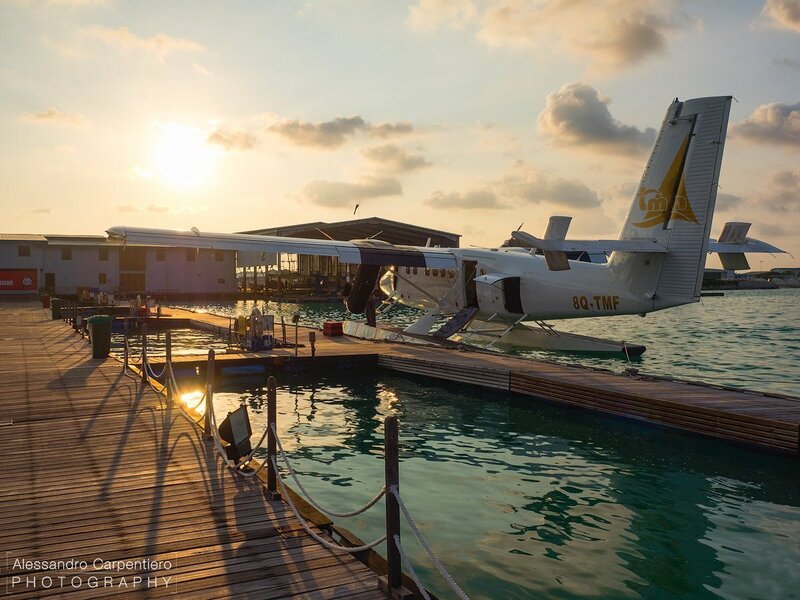 The seaplane transfer cost is of $405.00 for a roundtrip from/to Malé for each person. 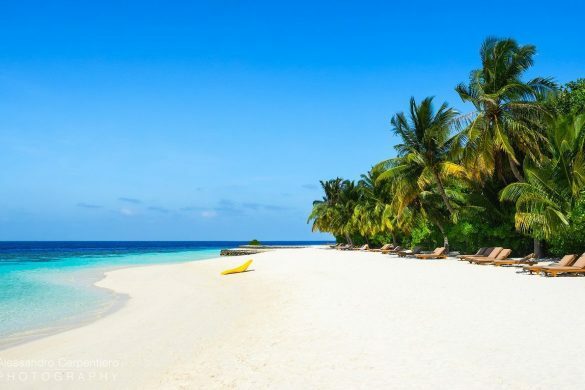 Lily Beach appears right away as a very well organized resort where you’ll find everything you might need, even if you’re in the middle of the Indian Ocean. 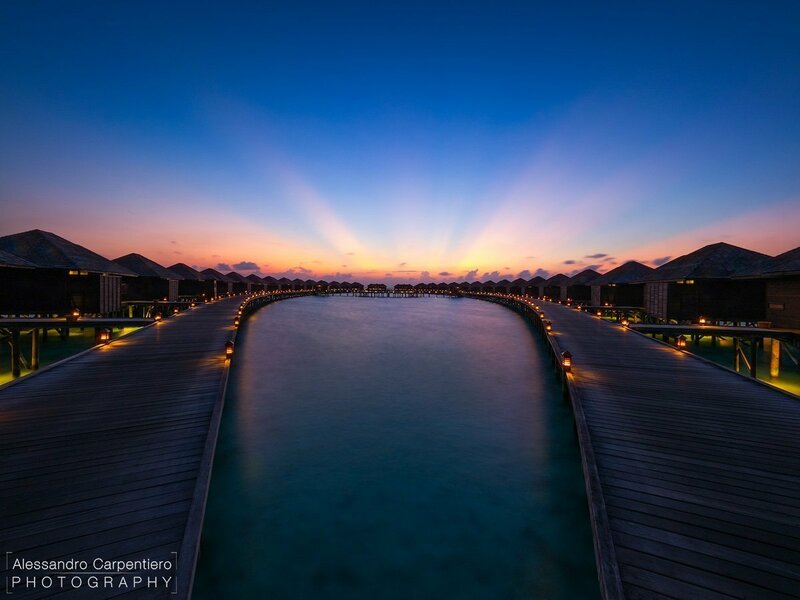 In fact, besides being a 5-star resort, it’s an All-Inclusive one! 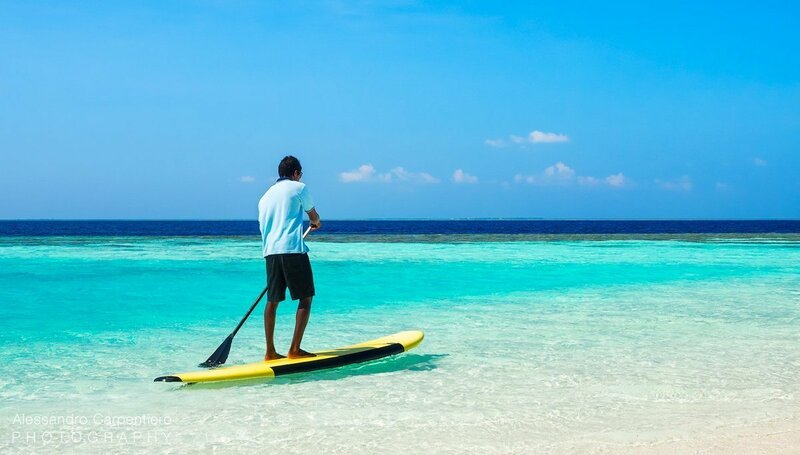 This is definitely a plus and it will make you relax even more, as you won’t have to worry about spending any extra money for food & drinks and trust me, with the Maldivian heat you’ll need plenty! The island hosts many facilities (more of that later), but still aims to maintain a natural feeling, with low profile buildings, usage of natural materials such as wood, respecting the island ecosystem. The few things that don’t, in my opinion, are the piers and breakwaters that circles the whole island; they are definitely there for a reason and make things more convenient, but they take away a bit of that “far from society and architecture” feeling. But hey, that’s just half of the island! 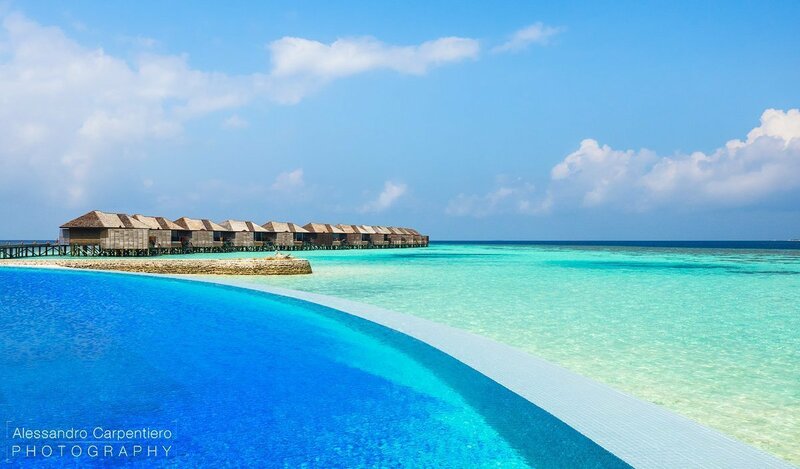 With a 2-min buggy ride, you’ll reach the side where the on-water-villas are located. 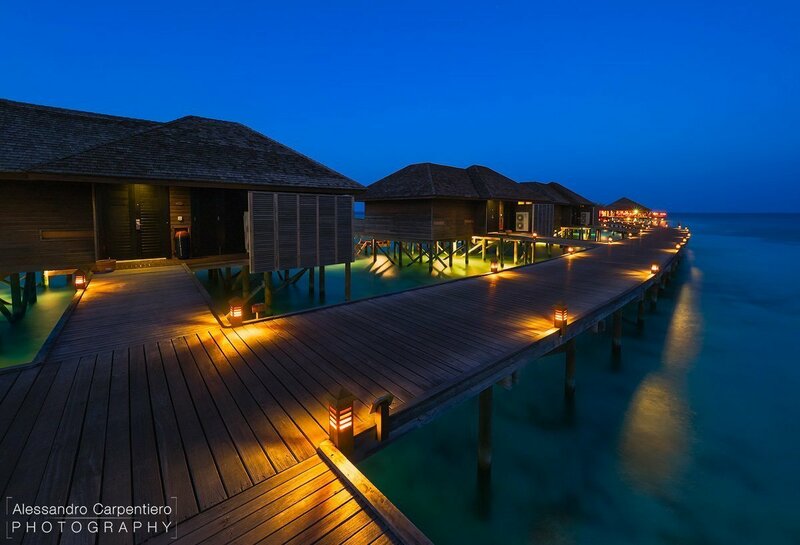 That’s a beautiful architectural & design work: the jetty leads to the on-water-villas with a harmonious and intriguing curve. 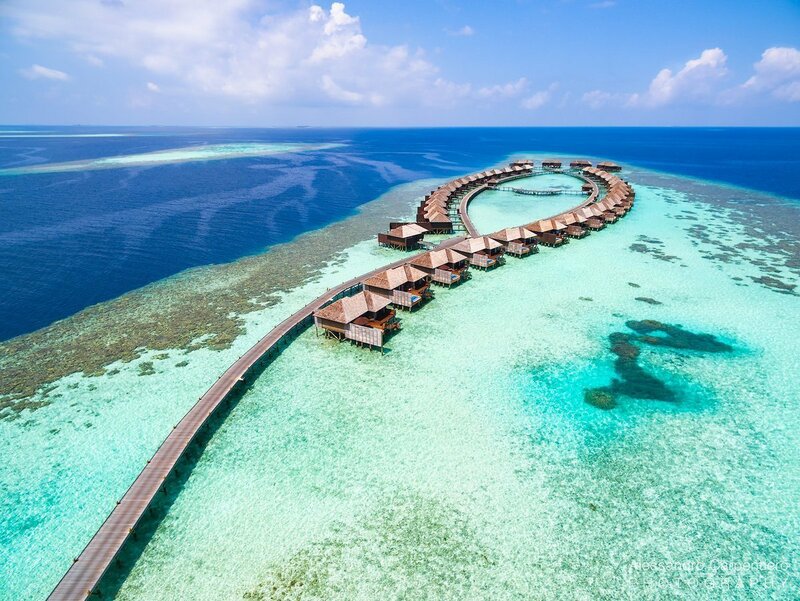 All this is built very close to the reef, and just a few swims away from the deep blue. 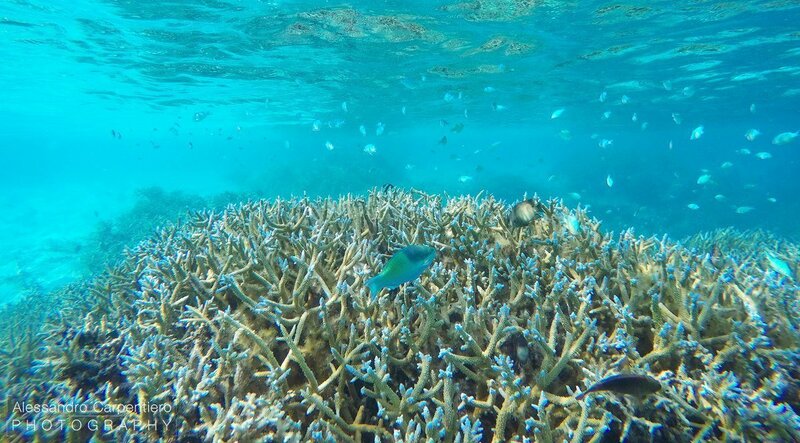 The reef of the island is a treasure much respected by the resort: corals were not harmed to build the villas and every client is reminded of how delicate these organisms are. So please do not touch them and simply enjoy the beauty of the underwater world. You can reach the deep blue by swimming through little canals created through the reef. What you’ll admire there is hardly describable: I’ve felt a deep sense of peace and realized that we’re like a drop in the ocean of this planet. 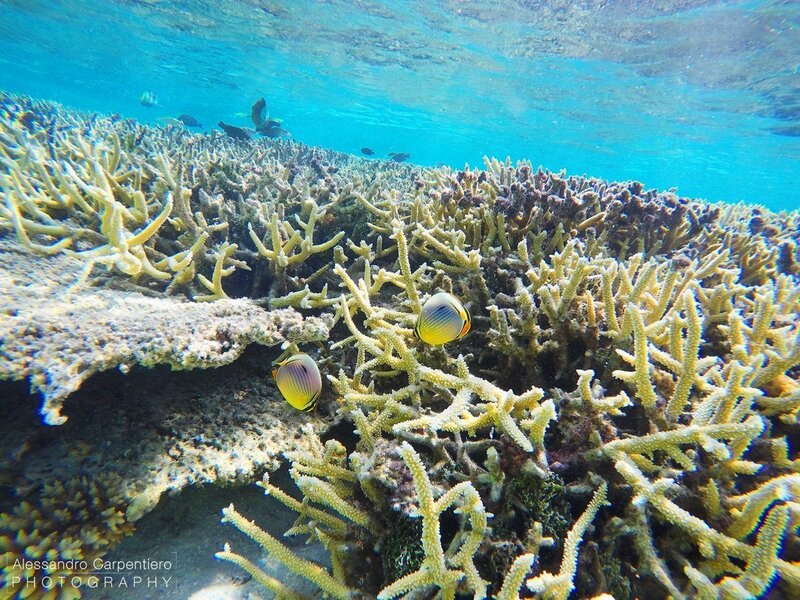 Did you forget the snorkeling gear at home? No worries, the resort will provide you with all the needed gear for free. Make sure to carry with you a GoPro (here on Amazon) in order to capture underwater memories! Lily Beach offers several kinds of accommodation, depending both on your budget and preferences: there are 5 different kinds of villas, for a total of 131. Simply choose if you would prefer staying on the land or on the water, and then choose the accommodation with the needed space for you. 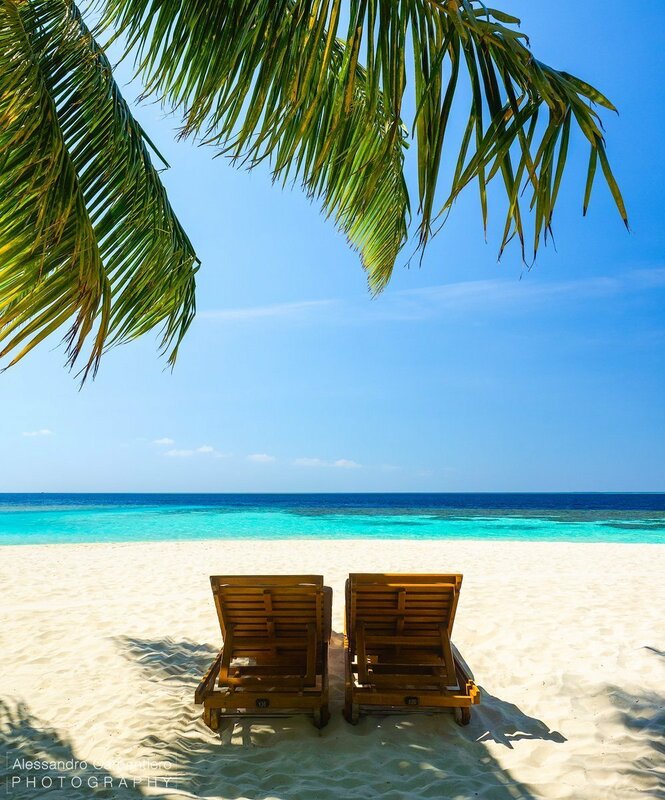 Prices per 1 night range from $762 to $2,177, depending on the kind of villa and the dates of your trip. Beach Villas (69 Villas, 68m²): these villas are located on the land, in the middle of the island vegetation, just a few steps from the ocean. 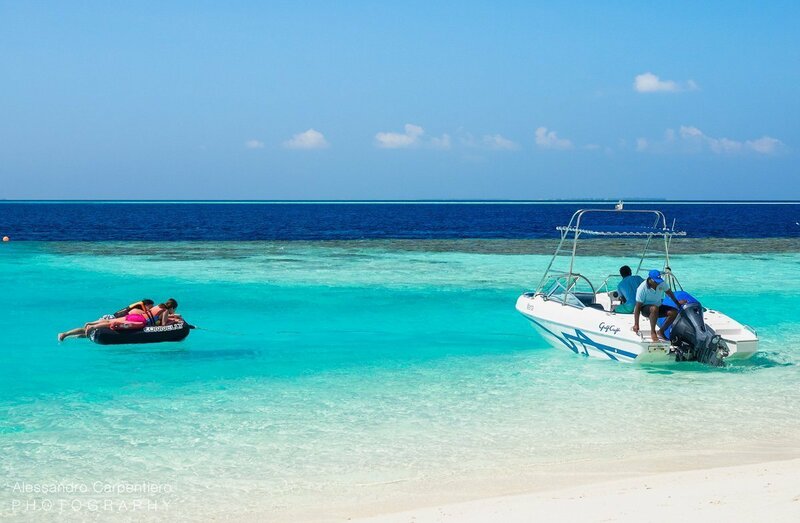 They’re the ideal choice if you want to be close to the main facilities; recommend to whom wants all the comforts of the island while saving some bucks. 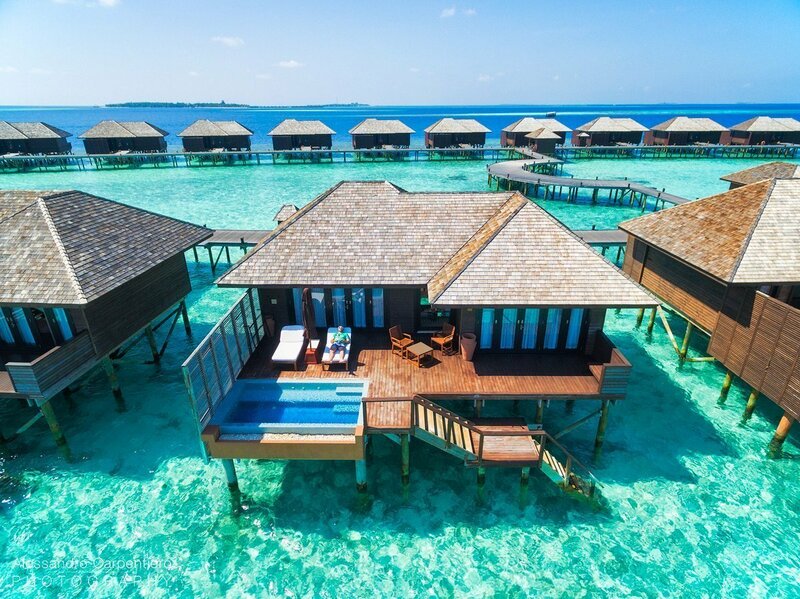 Family Beach Villas (6 Villas / Size: 90m²): these are basically two interconnected beach villas, which makes it a great choice for families so that they can travel all together but still have the deserved privacy. Lagoon Villas (16 Villas, 90m²): moving even closer to the water we find the Lagoon Villas; here you’ll have a private terrace with direct access to the lagoon and you will be able to admire the ocean directly from your king-size bed. This kind of villa has the intimacy of the water one, keeping the main facilities at easier reach. 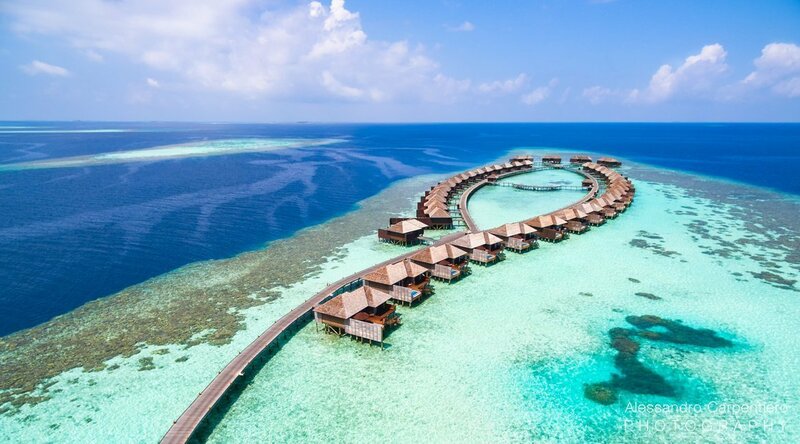 Deluxe Water Villas (36 Villas, 126m²): when you think about Maldives this is probably the kind of villa that you have in mind: total relaxation, privacy and luxury. 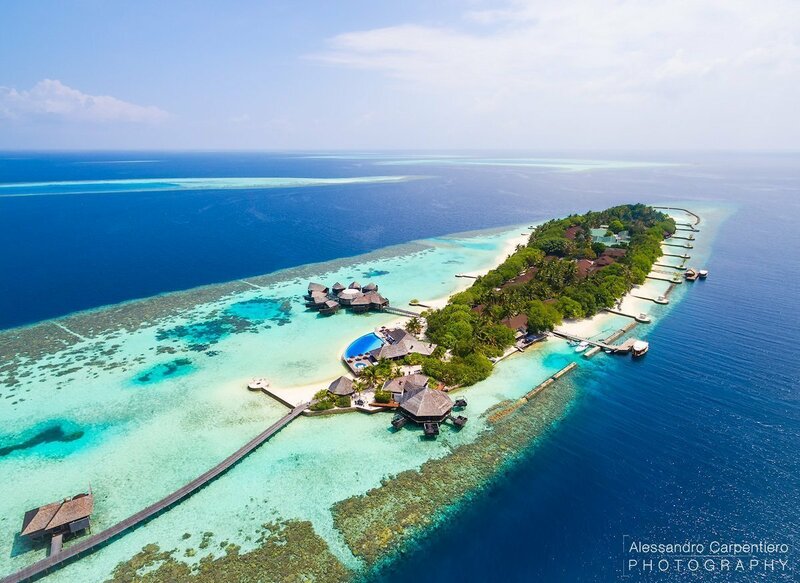 As you saw earlier the Water Villas are located just right after the land; they’re the most distant from the main facilities, which makes these villas the perfect choice to achieve ultimate intimacy, far from the island life. A buggy will always be ready for you to call and get to the facility you might need.I’ve had the pleasure to spend my stay in this fabulous villa, so I can tell you a bit more about it. As soon as the door opens there goes your “Wow!”. 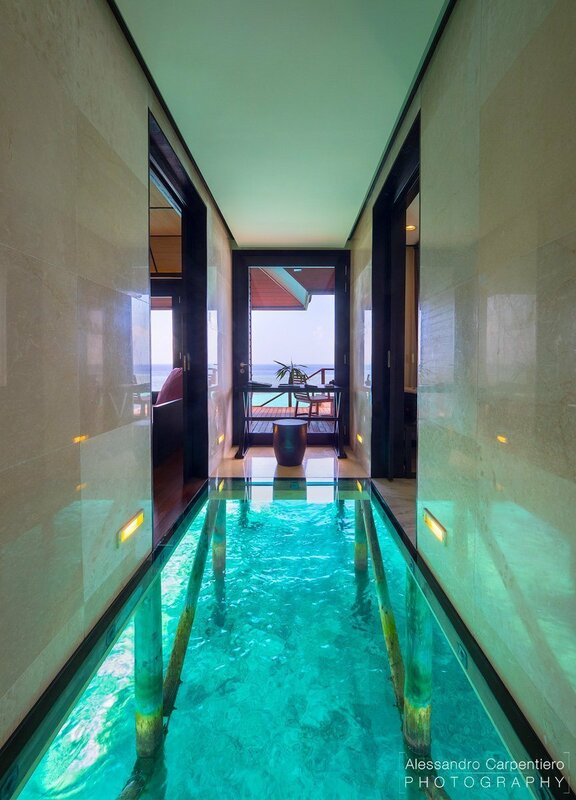 A glass floor leads you inside the private villa, making you feel part of the island itself. I’ve found this design feature to be absolutely gorgeous, as it’s a constant reminder of how beautiful the location is. The sun rays filtering through the water make their way inside the villa, getting bounced around the marble walls: simply magical! The washroom is very spacious and has every comfort ready for you to enjoy. The usage of a noble material such as the marble continues on the floor and the sink, being harmoniously coupled with the wood of the furniture and ceiling. The center of the room is taken by the Jacuzzi, where you can spend relaxing and intimate moments with your other half. 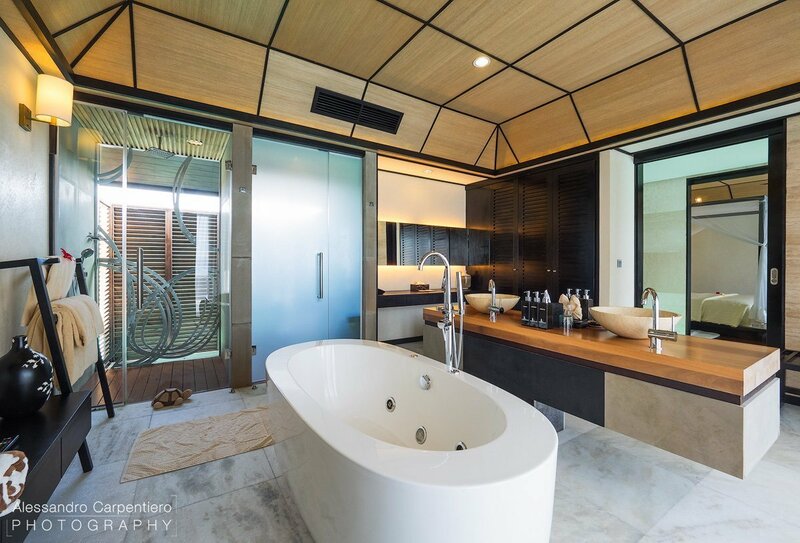 The two glass doors hide the shower on the left and the toilet on the right. Simple yet stylish, the bedroom gives very cozy vibes thanks to the dark parquet on the floor and light wood on the ceiling. The classy touch is given by the baldachin bed, which will make you feel like in a fairytale (although actually you’re in one already). The room has of course all the needed comforts, complimentary minibar fridge, Hi-Fi Stereo, Nespresso coffee machine (which as an italian is something that I’ve incredibly appreciated), and much more.Both the washroom and the bedroom have a very wide sliding window, which will lead you to the private terrace. This is a big plus of this suite and it makes you feel literally on heaven; how stunning is it to wake up with such a view? 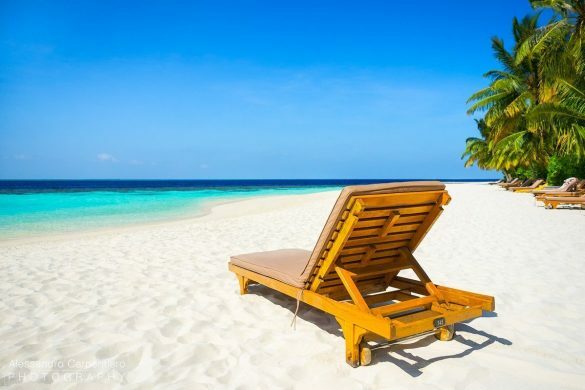 If you take a closer look to the image above, you can even see me relaxing after a busy shooting day on the sunbed. Life is though right?As you can see above, the outside part of the villa is a real beauty: the private terrace is provided with 2 sunbeds with a sun umbrella, a little table, 2 chairs and a beautiful pool. 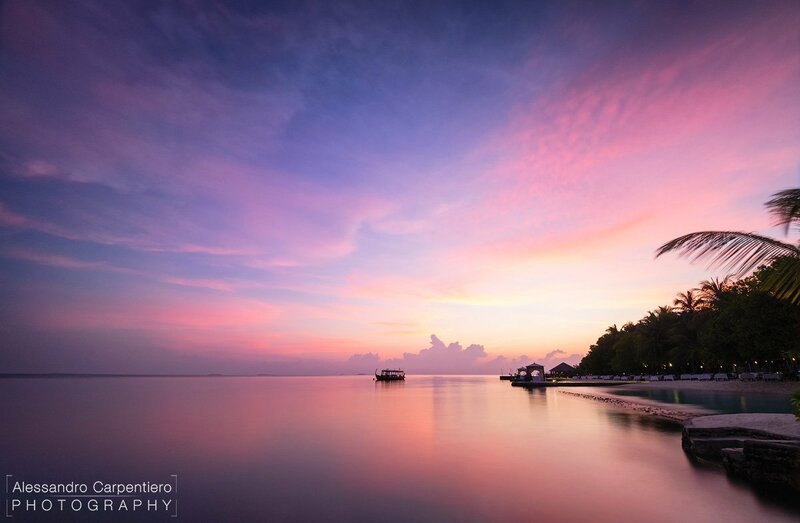 From there you can just relax and admire the stunning beauty of our planet, letting your eyes wander towards the infinite horizon while listening to the calming sounds of the reef. 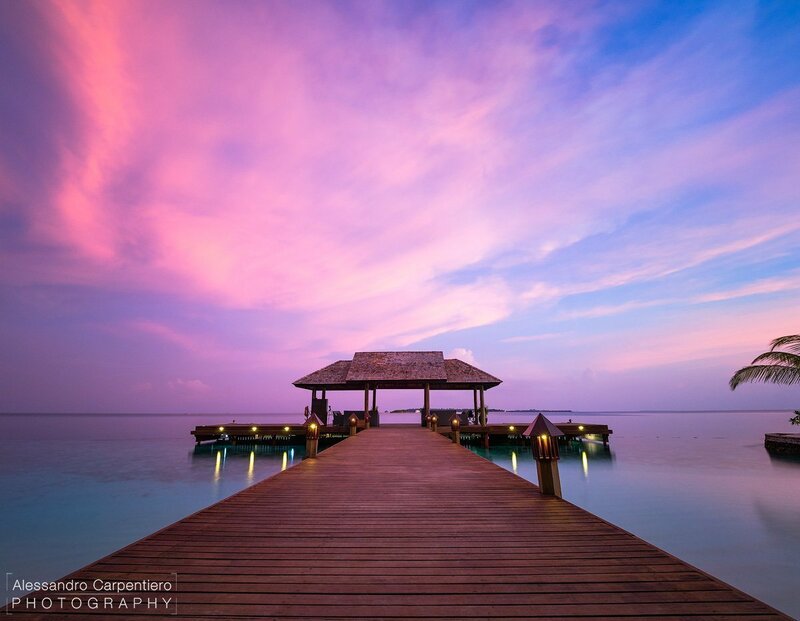 If you want to enjoy something bigger than your private pool, a wooden staircase will create your private access directly on the Indian Ocean. Sunset Water Suites (4 Suites, 182m²): this is the most exclusive accommodation the resort has to offer. 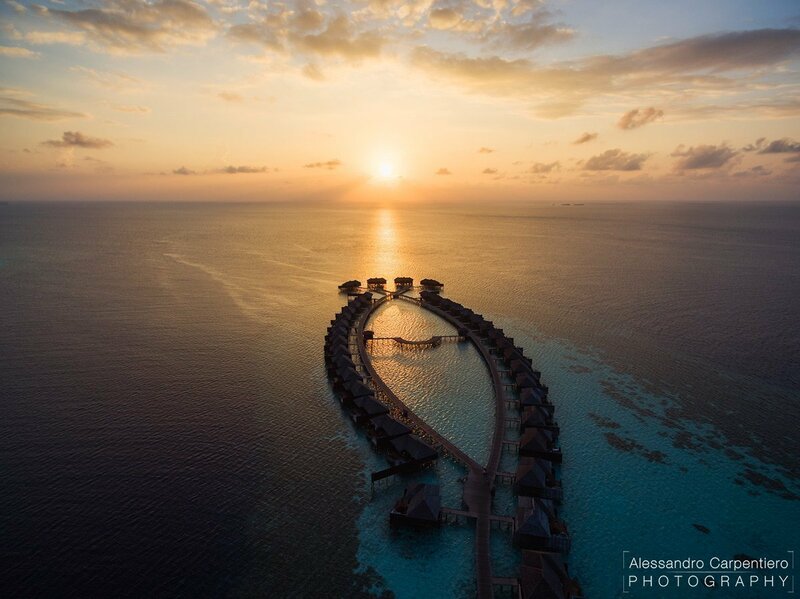 They are just 4 suites and they are positioned in the most privileged spot; they are in fact facing towards where the sun sets, gifting you with spectacular scenes every evening. It’s almost 60m² bigger than the Deluxe Water Suites, offering even bigger rooms, a huge 14m² Jacuzzi and a 24-hour private butler service: one can’t simply ask for more. 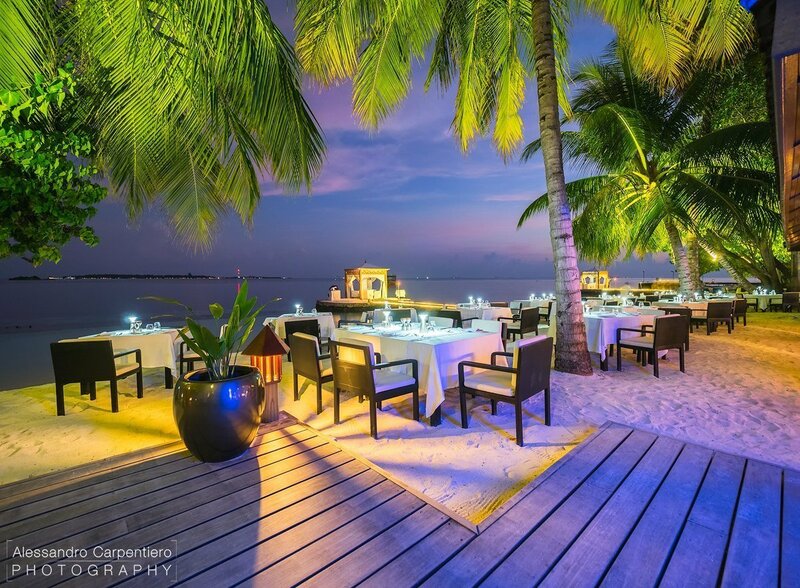 Dining is taken very seriously at Lily Beach Maldives: it is just an island in the middle of the ocean but it has 4 restaurants and 3 bars, which offers an incredible variety of cuisine styles. 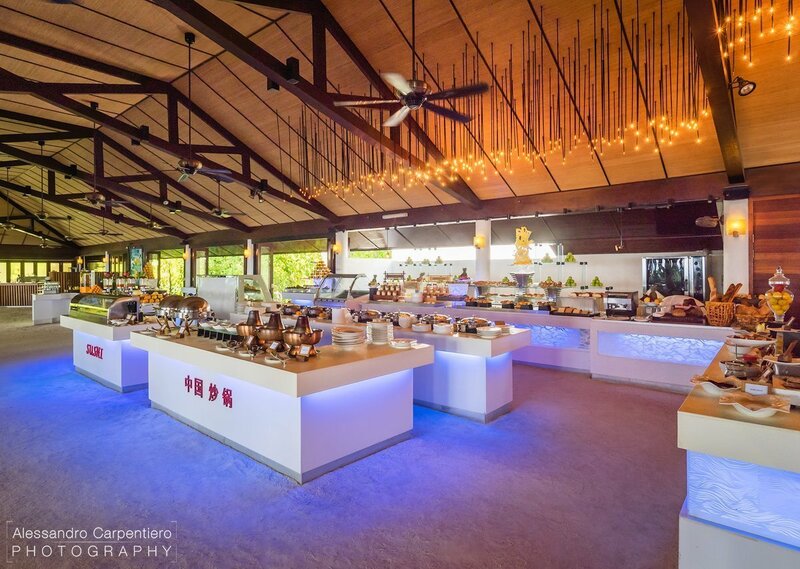 Lily Maa: it’s the resort main restaurant, where you can enjoy all the meals presented as a buffet. Lily Maa offers a great variety of quality food. The variety of food is incredible (also for vegetarians), and the restaurant features a different world cuisine everyday. Not only there is really a great choice for food, but it is also very fresh and well cooked. Definitely approved! Tamarind: à la carte restaurant specialized in popular dishes of the Orient and India. Good news is that one dining per person per week is included in the Platinum Plan! (more about that later). Teppanyaki: Inside the Aqva Bar there’s a teppan iron griddle where every evening you can see the chefs cooking your dinner with the traditional Japanese style of Teppanyaki. The station can accommodate groups of up to 12 people. Not included in the Platinum Plan. Les Turquoise d’Aqua: fine dining experience consisting of a five-course degustation menu, nominated for the 2016 World Luxury Restaurants Awards. Not included in the Platinum Plan. 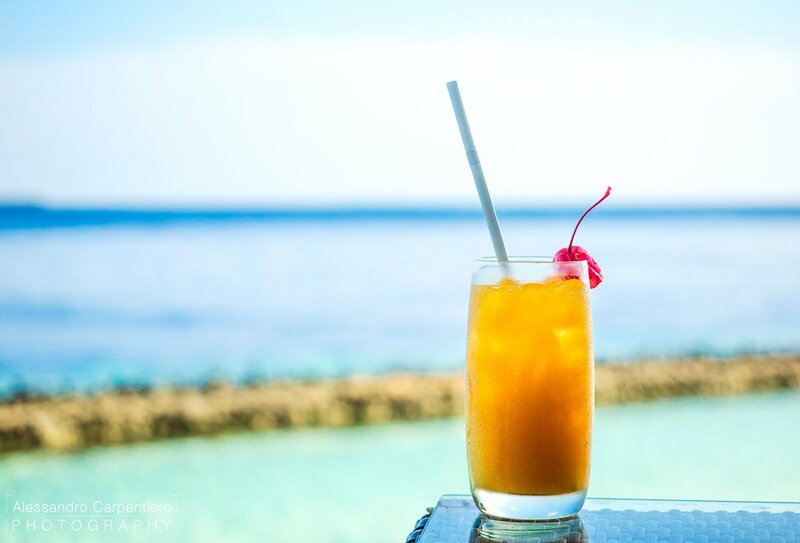 Aqva Bar: Located on the sunset side (just before the jetty), it’s the perfect choice to have a little snack during the day with a tasty drink. 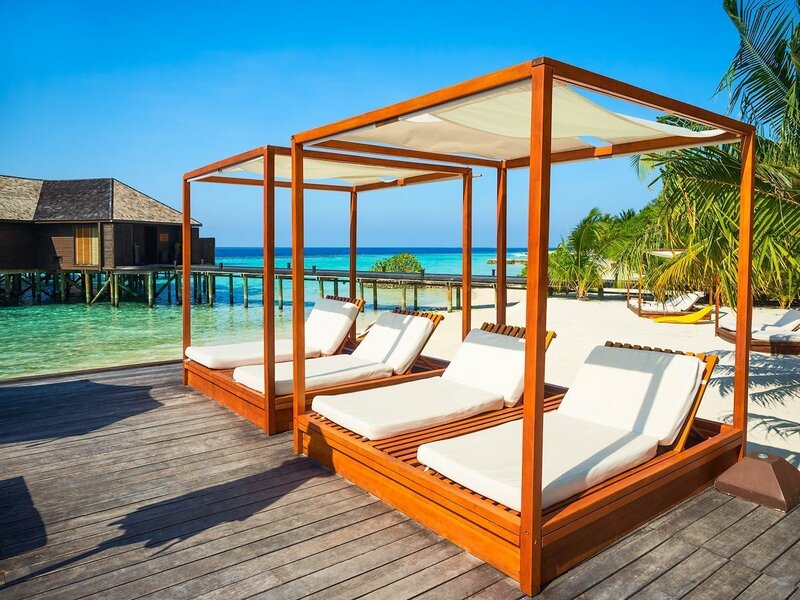 You can relax with your partner in one of these big sunbeds. 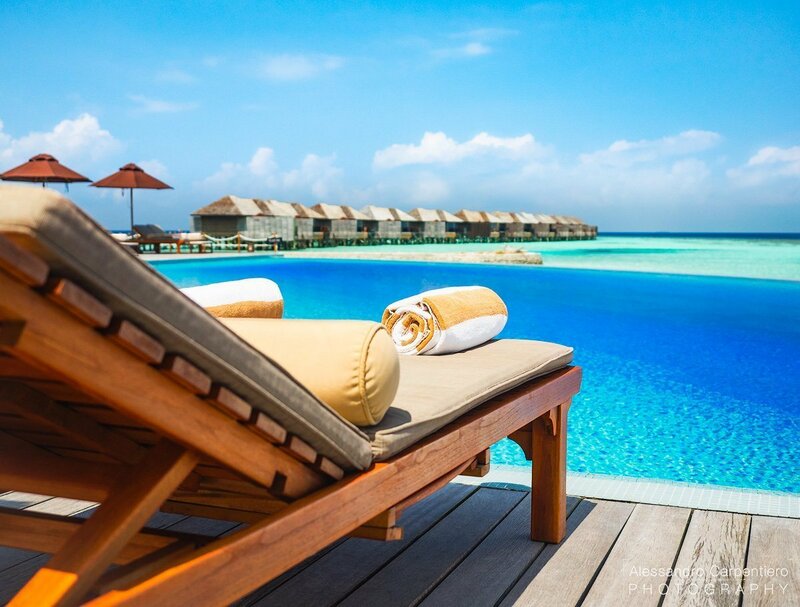 Or lay just next to the beautiful infinity pool, where you can refresh yourself from the Maldivian heat. 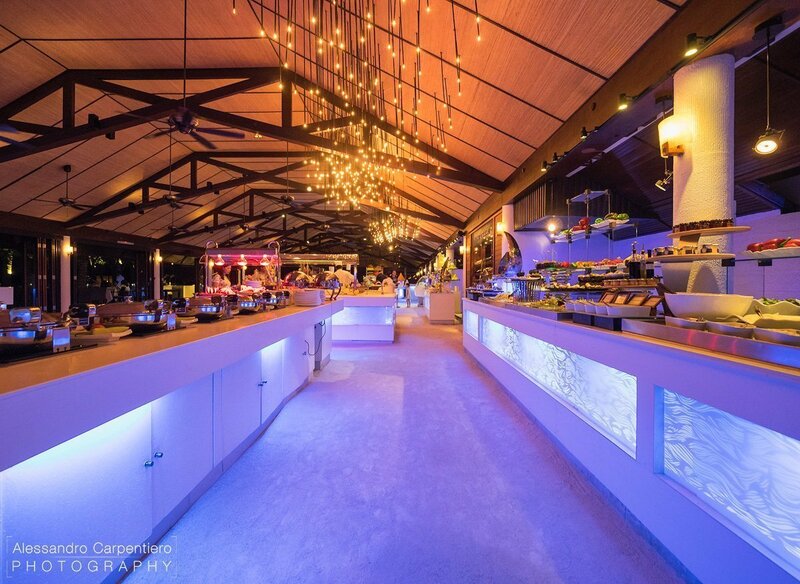 Vibes Bar: this is a bar specifically created for family fun in the sun and evening entertainment; it has a shallow pool and it’s positioned on the opposite side from the on-water villas. 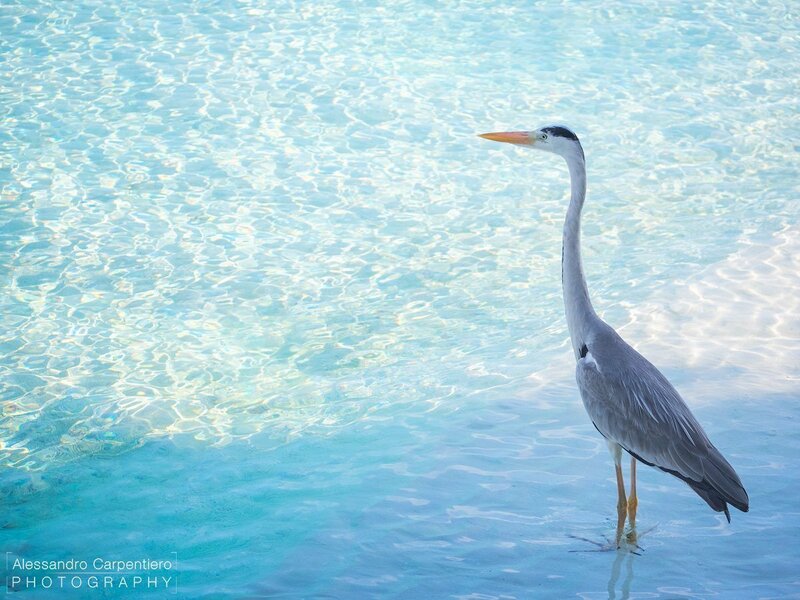 Many times you’ll also have the local wildlife keeping you company, just like it happened to me with this beautiful grey heron. As you would expect from a resort of this kind, you will have endless options for relaxation, leisure and activities. 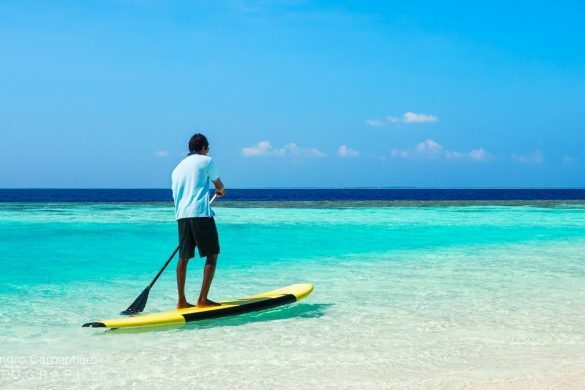 You can pamper yourself at the SPA, go for a dive, enjoy a water sport or simply enjoying the sun at the beach. I have visited this resort for reviewing the experience for couples, which as you’ve probably understood is excellent. 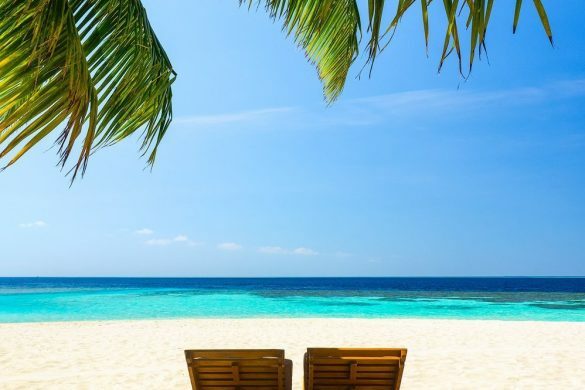 The whole atmosphere is very relaxing, private and intimate, whilst giving you a great variety of options not just for laying on a sunbed but being active and discover the natural treasures of the island. That being said, Lily Beach is also absolutely suited for families with children! 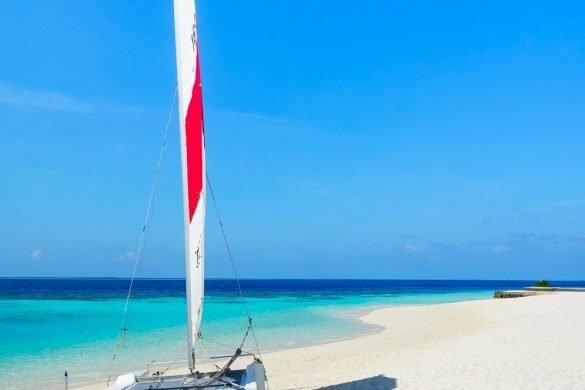 The Turtle Kids’ Club will take care of your little ones with watersport activities, crafts, treasure hunts and much more., while parents will be (finally) able to enjoy a well earned rest. 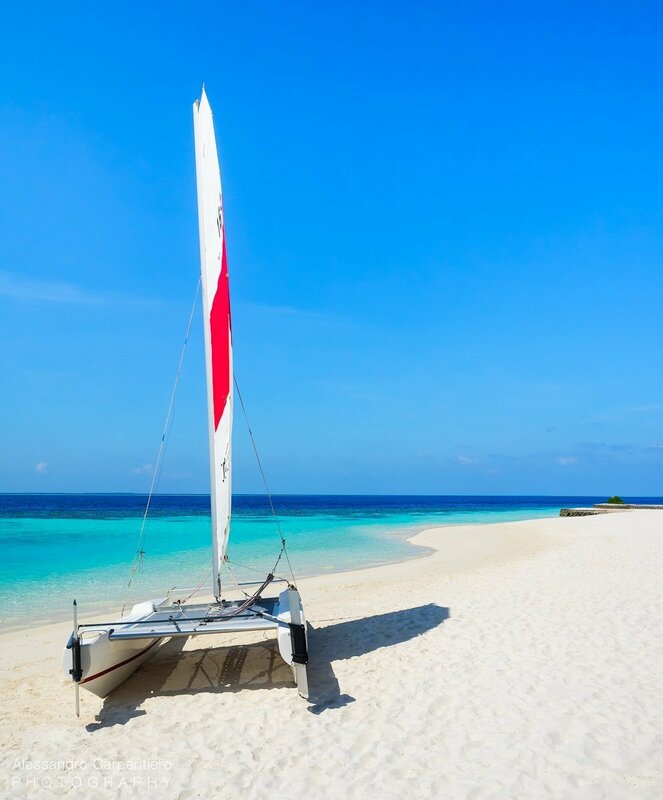 When designing an all-inclusive resort is easy to make it lose that exclusive feeling, but Lily Beach has definitely surprised me creating a perfectly balanced mix of all the ingredients needed to create a truly luxurious Maldivian vacation. Thank you, Alessandro, for such an informative review! Must say the pictures just leave with no words! Good job! Considering this hotel to stay at, after the review 99% will do! Glad you’ve liked this Glen; Many Thanks! Hey Alessandro, thank you so much for the review! 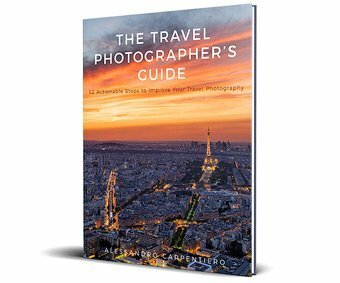 I’ve never been ther but thanks to you for this information 🙂 and what can i say about your photos its just amazing have no words to describe how beautifully you capture a place! 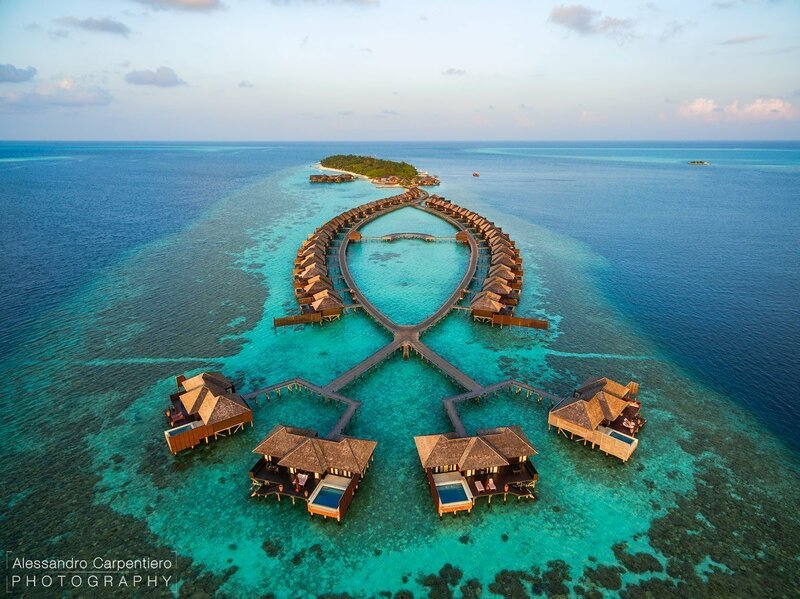 My husband and I stayed at Lily Beach for our honeymoon in September 2016 in the Sunset Water Villas. The experience was truly out of this world. The butler service is OUTSTANDING. And the all-inclusive package is phenomenal. We did not want to come home and miss it every single day.